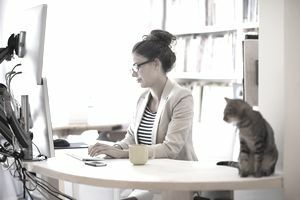 The number of work-from-home computer jobs has increased in recent years, with more companies becoming familiar with the concept and remote collaboration technology growing increasingly commonplace. While many of these jobs—e.g., software developers, web designers, data engineers—tend to require advanced skills, there are plenty of easy, entry-level, work-from-home computer jobs out there. You just need to know where to look and what to look for. A virtual assistant provides remote administrative support to a company, team or executive. This includes a variety of administrative tasks such as scheduling meetings, booking travel, responding to emails, phone calls or messages on social media, entering data or maintaining records, and much more. Like many remote jobs, virtual assistant positions are offered on both a freelance and full-time basis. You can search on remote and gig work sites for titles such as “VA,” “virtual assistant,” “virtual executive assistant,” or “virtual office manager,” and more. You can also find these types of jobs on freelance and flexible job sites like FlexJobs, Upwork, Guru, and Fiverr, for example. When applying, you should prioritize your organizational, communication, and time management skills. In addition, since you’ll be working entirely online, it’s important for a virtual assistant to have experience with the latest technologies. You should be familiar with industry-standard communication and collaboration platforms, including online calendars; word-processing software and spreadsheets; email and messaging tools such as Gmail and Slack; audio-video conferencing platforms such as Skype, Slack, and Google Hangouts, and screen sharing tools. According to PayScale, on average, virtual assistants make $15 per hour. Most remote customer support associates serve as the “front line” for all customer communications. These include resolving issues, answering questions, providing information, and more, and may take place via email, online chats or phone calls. Smaller organizations may bundle all of these channels into one, whereas at medium-sized or larger companies, you’re likely to see the job split up; e.g., a “help desk associate” will be answering all queries coming through email or online chats, and a “call center associate” will handle customer phone calls. You have a couple of options when it comes to finding a remote customer support associate job. You can search any remote site for customer support positions, which can appear under titles like “customer service representative,” “customer success manager,” “customer care specialist,” or “customer service agent,” for example. When applying to remote customer service jobs, try to emphasize any prior customer service or hospitality jobs, as well as excellent communication and conflict resolution skills. According to Glassdoor, the average customer support associate makes about $35,000 annually. A remote data entry clerk manually enters, updates or manipulates numeric or alphanumeric data (e.g., numbers or a combination of letters and numbers) into a database via their own computer. Similar to the jobs above, remote data entry jobs are available on both a full-time and freelance basis. You can search for terms like “remote data entry,” “remote data entry clerk,” “remote data operator,” or “virtual data entry,” for example. When you’re applying for remote data entry jobs, your employer will likely request your typing metrics––e.g. “Kph,” or keystrokes per hour, and “wpm,” or words per minute. You should be able to type a minimum of 8,000 kph (though 10,000 is preferable) as well as a minimum of 50 wpm. According to ZipRecruiter, a mid-level data entry clerk’s salary ranges from $27,000 to $56,000, while the average pay is $37,000 per year. Entry-level clerks, however, generally start at a lower rate, and hourly wages can dip as low as $9 - $10 per hour. While it may sound strange, there are many remote “odd jobs” you can find online. While you shouldn’t expect to earn a living from just one of these, you can use one as a side hustle or combine them for a greater income. By the nature of the term “odd job,” it inevitably varies. The key is to know where to look for these types of jobs and what to look for. You’ll find the widest range of jobs on freelance sites like Upwork, and you can search for jobs that fit your interest or experience. Maybe, you’ll pick up a 2-day long data entry project this week and an audio transcribing project the next. Craigslist is another good resource to consult. Check the “Computer” section under “Gigs,” and either scan the listings or search that category for terms like “remote,” “work from home” or “virtual.” It can be worth searching the main “Gigs” category with these terms too. Other online odd jobs include taking surveys, participating in panel research groups, and completing micro-tasks on Amazon’s Mechanical Turk platform (or similar sites such as SwagBucks or Clickworker). There are also money-making apps you can use to sign up for quick gigs or to provide professional services. It’s important to stay diligent and research the legitimacy of any platform before you sign up; this is to ensure it’s not a scam. You can search for reviews online, or see if the company has a listing with the Better Business Bureau. Finally, if you’d like to solicit work rather than search for it, you could also sign up and sell your services on Fiverr. The pay will inevitably vary in this case, and it will depend entirely on your output and the amount of time you dedicate to working these types of jobs. On Amazon Mechanical Turk, the average pay ranges from $6-12 per hour. You may find gigs that pay more on freelance sites or on Craigslist. Note that any job or platform that positions itself as a “get-rich-quick” opportunity is very likely a scam; if it sounds too good to be true, it probably is.